Posted: Sun Sep 25, 2016 5:14 pm Post subject: Hello! Hi just started my Jedi WIP. Hope to join the ranks someday. I'm located in Placerville California. Any members close by? Welcome. My wife and I are in Reno, but there are members scattered around Northern CA who should be closer. I'm not a full member yet (waiting on my boots and lightsaber so I can apply), but I'm in Sacramento. Hey, just curious, did you make your own costume? No. I had planned to, but my wife would not let me touch her sewing machine (I haven't used one in 30 years), and when we attempted to work on it together it lead to some frustrating discussions, so we decided to abandon that for now. 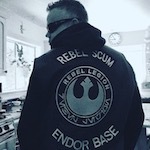 So I ended up getting the tunic from Hampton's Jedi Outfitters, in Yuba City. I've gotten my wife to promise to teach me how to use her machine to her satisfaction so I can make future costumes, but we'll see. ETA: This makes my wife seem unreasonable--she's not. Most of the difficulty in working together was caused by me.